NeoGeoForLife.com - Kazuya's Neo Geo Reviews - News: KOF XII DLC? I am a little out of date with all the latest SNK news due to my prolonged absence, but I thought I'd post about something that I just read. 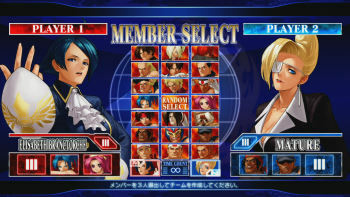 Apparently KOF XII for the PS3 and Xbox 360 is going to feature downloadable content. While I am all for DLC, and quite happy to pay a little bit if it is something that is worth it, I think many companies just use it as an excuse to get more money from people... I'm really hoping this isn't the case with SNK and KOF XII! It's possible that they might offer stuff like extra costumes (see SFIV), which personally I would avoid like the plague and not even consider buying, but what about the prospect of extra characters? If they added them later on and released them as free updates then fine... but if you had to pay for them? Ugh. What do you guys and gals think of this? Let's say for example that SNK released a character pack that featured Mai Shiranui and it cost a few $'s/�'s? Would you be tempted? Personally, as much as I would want Mai enabled, I don't think there is anything that would make me pay extra cash for it! What happened to the days when playing the actual game and completing it was what you did to enable extra content? As much as DLC can be a great thing, it really has made certain companies greedy... (cough... Capcom.... cough). I hope SNK isn't going to go the same route. As an example of good DLC, Valve recently put out the survival pack and other updates for Left 4 Dead for free, which is great (as a side note I am hopelessly addicted to that game right now ;). Hell, if they release some good extra stages for L4D at a later date and charge a little for them, if I think it's worth it then I'll grab them. Paying money for stuff that should already be a part of the disc or should be free is a big no no for me personally though! Opinions? Obviously we don't know what DLC will be available for KOF XII yet so it may turn out to be great and it may even be free, so it is all speculation at this point. How much are you willing to spend though? They should add new special moves/supers has DLC. 5 dollars for Power Dunk! 10 dollars for BUSTER WUUULF! lol! Even that wouldn't surprise me, the way some companies act with their DLC. 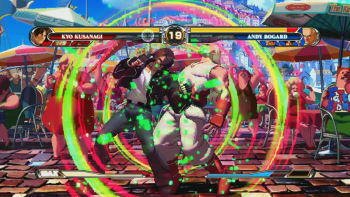 "unlock the full awesome Terry Bogard move set for only 800 MS Points!!!" DLC is a joke if its all about buying extra features that can easily be implemented with the full game installation..
DLC should only be made to improve the game, and fix bugs.. not buying pointless outfits and extra characters.. I would buy all DLC for KOFXII - depending on price. I would happily pay a tenner for 4-5 extra fighters (inc Mai). I would like extra stages too. Most games I wouldn't bother with DLC. Its only the good ones I would get DLC forl. Wonder if they can tweak the gameplay with DLC. If they can - then it would make yearly KOF games redundant. I don't think they will add new characters in DLC. Maybe in a newer standalone game. I think it's clear that SNK is packing everything they can into this game before deadline. With that said, if they finish a few new characters for KoFXIII and decide to make them available to us as DLC for XII then I don't see that as being greedy at all. Of course, some games support DLC and never get any. So it's possible they're just leaving the option open to themselves and will never release anything since as soon as this game is out the door they'll probably get right to work on KoFXIII. Oh, and I vote yes for a "12 New Costumes for Athena" pack. So far there hasn't been a single fighting game released that had "additional character DLC" so despite the rumor popping up with every single new release in the genre I don't think anyone has to worry about that anytime soon.